Home › Document file conversion › Improve your Presentations! Presentations are key in many fields nowadays. In school, you have to present certain topics to the class, in university you are asked to present your research findings, and in your company, sales numbers and marketing strategies have to be presented to your boss or coworkers. Talks, speeches, workshops… Even when showing off your vacation photos to your family and friends, all thee things involve presentation skills. But not everyone is skilled in presenting themselves, their findings, or their current work. Following, we listed some tips how you can improve your presentation skills on a personal as well as on a technical level. The most important part of a presentation is of course the oral one. Presentations can be handed out as notes or books or in PDF format, but what you have to say about the facts presented, side information and explanations, those information come from you personally and are given to your audience via speech. For most people, that’s the most tricky part. Excitement, uncertainty, stage fright; all these things can come in between your and your successful presentation. There is no magical solution to make stage fright disappear, but there are methods you can use to feel less nervous and more confident while presenting. And by practice we do not exclusively mean that you should practice to go through your presentation beforehand. This is a crucial part to show you how much time you need, and a small audience can already point out where you need to explain a few things more in depth. But practicing presentations in general is just as important. The more often you speak in front of people, the more self-secure and confident you become. Present interesting newspaper articles or something that happened to you during the day to your friends, or volunteer to give a little thank you speech in your local sports club or some other club you may be in. Holding on to cards or scrips may add some security to your speech flow, but you are more likely to avoid eye contact with your audience that way, your eyes being glued on the paper. Learn to present your contents freely. This way, you are more open to clues from your listeners as well, noticing very fast when they get stuck and you have to do some more explaining. Are you fearing that you could get stuck? Use your presentation slides as keywords and clues what to say. They can function just as well as notes, make no extra work, and won’t distract you from presenting your findings instead of simply reading them out loud. Whether you are presenting a topic in school or university, or your current work in your business, keep one thing in mind: You are the expert! You read several articles and books about your topic, and you’ve been working in your field and with your method for years. In most cases , that means that you know far more about the topic than your audience does. Don’t fear questions, rather take them as interesting clues or to spark a discussion (if allowed/appropriate). Reminding yourself that you are the expert in whatever you present is an extra confidence boost as well. Getting better at the speech part of a presentation requires training. Improving the visual aids is, in this term, a lot easier. Tools like Microsoft’s PowerPoint made it easier to present visual data like graphs, images, and short text compared to scrolling through a very text-heavy Word document. However, soon, PowerPoint became a synonym for boring. But it doesn’t have to be like that! There are many lists throughout the net that explain what and what not to do when creating a PowerPoint presentation. Avoiding bullets and a confusing background design are just a few to name. Yet, the best judge are you yourself. 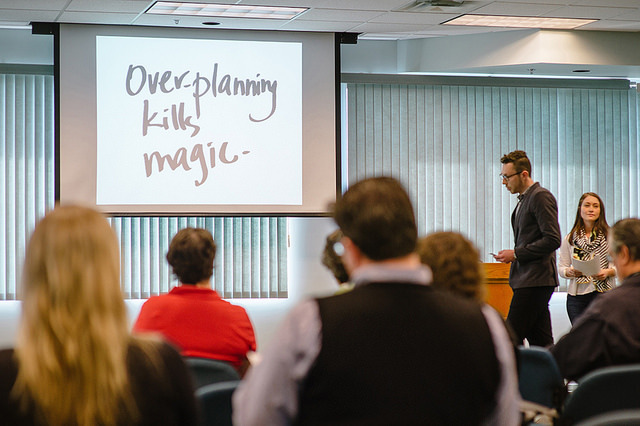 How many bad presentations did you have to sit through in school or business meetings? Instead of taking notes of the content only, take notes of what you didn’t like about the presentation style as well – and avoid such “mistakes”. It is more than likely that things you don’t find appealing in a slideshow are boring or annoying to sit through for others as well. Sure, a slideshow can be nice to look at, but instead of spending hours tweaking your design, it’s the content that should matter. Don’t waste valuable time with wrecking your head about the presentation when there are tools that can help you. Creating slides in your preferred word processing software may come a lot more natural than working with slideshow programs. Use the program you are most familiar with! Because converting your document into PPT or PPTX is done very quickly afterwards. That’s something everyone knows. You want to hold a presentation and your laptop is not compatible with the projector, or the PPT presentation you sent looks crooked and weird because the operating system handling it uses OpenOffice or some Apple native program. It’s annoying, takes time to fix, and can destroy the whole presentation’s flow. We say: Rather be safe than sorry! Saving your presentation in different formats limits the risk of the target computer messing things up. Want to be on the safest side? Convert your presentation to PDF as well, since PDF documents are readable on any computer with any operating system. Besides, having your presentation saved in this format makes it easier for printers to keep the set formatting in case you want to hand out the slides or publish your presentation online. If your struggling to get your audience’s attention, maybe it’s time to do something entirely different. Be brave, be experimental. How about a presentation without any text, only with graphs and infographics that underline your words? A slide with one essential keyword may help you get the attention you wanted a lot better than showing a long and boring list of features or do’s and don’ts. Or have you ever thought about converting your presentation to video? You can even add music, sound effects or additional audio comments to publish it online, upload it to YouTube, or simply impress and stick out on a conference.